A call to Camper & Nicholsons brings news of another addition to the sales fleet as Alex & Gaston Lees-Buckley sign the 46.55m motor yacht Illusion I for sale. Built by Benetti in 2010 to ABS class and MCA compliant, her large interior areas, designed by Studio Galeazzi and Argent Design, accommodate 10 guests in three double and two twin staterooms while twin 2350hp Caterpillar engines give her a range of 4,000 nautical miles. 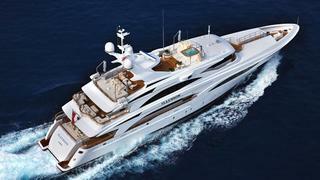 On display at this week's Monaco Yacht Show, Illusion I is asking €23.75 million, VAT included.